The suprisingly lightweight design and built-in handles and wheels make Detectos BRW1000 "Roll-A-Weigh" Scale capable of being moved wherever you need it for bariatric weighing. Whethers its multiple weighing locations at a single facility or a stationary location, the ?Roll-A-Weigh? gives you portability, ease of use and accuracy. Designed for bariatric weighing ?on-the-move?, this portable scale features a MV1 digital weight indicator that can be mounted on the scale, or remotely on a wall, or desk for convenient viewing. 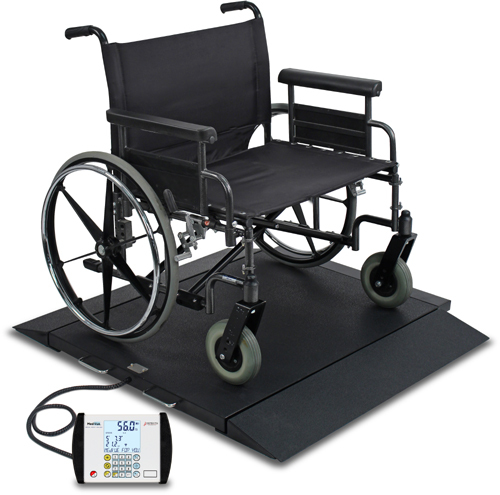 Heavy-duty construction, large rubber deck safety plate platform with integral ramp, and the 1,000 lb capacity makes this the perfect scale for weighing patients in manual or power wheelchairs, dialysis patients, or walk-ons. Accommodating up to 40 inch (101 cm) wide wheelchairs, the American-made BRW1000 provides everything required for weighing bariatric patients. For added comfort, a patient may be wheeled onto the scale and the chair tare weight keyed in for an easy weighing. Heavy-duty, extra-large platform measuring 40 x 30 inch (101 x 76 cm) with integral ramp, and 1,000 lb capacity makes this scale perfect for patients in manual or power wheelchairs, dialysis patients, or walk-ons. EMR/EHR ready with serial, USB, and optional Wi-Fi Ethernet connectivity. The BRW1000s integral handles make it easy to lift and lower into position. Built-in wheels permit the scale to be rolled anywhere its needed. The extra-wide platform easily accommodates bariatric wheelchairs up to 40 wide.